But the Chico's version is WAY better! Liz, I completely agree -- A bold look! I couldn't have phrased it better myself. In general, I just love Michael Kors, but I'm not sure about this look. I, too, would probably start with the Charlotte Russe piece ... I can see it growing on me! Great post!! I have been obsessing over the necklace as well - can't wait to scoop this up. I enjoy fashion as much as the rest, but this necklace is just idiotic. Who wants a hunk of cold metal hanging around their neck in the freezing cold winter? Anyway if you really insist, you can skip all of the budget options and go down to your local hardware store and buy a foot of chain for a buck or two and look just as ridiculous--but for much less! 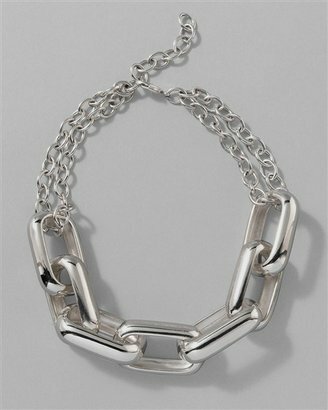 Hi ladies, I have the Michael Kors look a like necklace's back in gold, silver & hematite, it looks just like the Kors necklace. Please contact me pronto if you'd like one. Email me at tray5560@nc.rr.com and I will send you a picture, but you must email me right away, they are flying out of my door!! Hi ladies, I have the Michael Kors look a like necklace's back in gold, silver & gunmetal, it looks almost exactly like the Kors necklace. Please contact me pronto if you'd like one. Email me at tray5560@nc.rr.com and I will send you picture's, but you must email me right away, they are flying out of my door!! I also have the new look a like Louis Vuitton statement necklace's in gold & silver. They are selling out fast as well! !